Infant wearing a gown with embroidered trim. 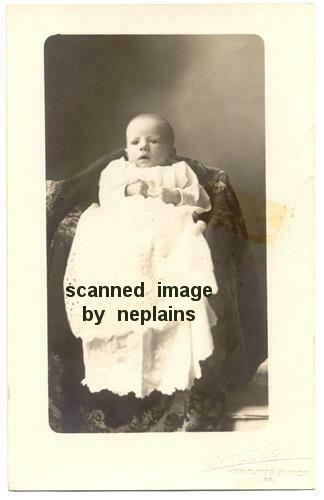 "Neil Everell Rittenberg ... 2 mos old" handwritten on back. Location is unknown; photo was found with other items from southeast Nebraska and northeast Kansas. Real Photo postcard, AZO (1904-18). Photographer's stamp at lower right corner is, "H H Stich", "Hamburg & Sidney IA". Minor corner tip wear. Crease at lower right. Approx 1-inch area of cello tape adhesive near center of right edge.